The function of any breathing circuit is to deliver oxygen and anesthetic gases, and eliminate carbon dioxide. Carbon dioxide may be eliminated by either washout with adequate fresh gas flow (FGF), or by soda lime absorption. Open systems have no valves, no tubing: for example open drop ether, or a nasal cannula. In either, the patient has access to atmospheric gases. Photograph of the Mapleson D. Click on the thumbnail, or on the underlined text, to see the larger version (136 KB). All non-rebreathing (NRB) circuits lack unidirectional valves and soda lime carbon dioxide absorption: thus, the amount of rebreathing is highly dependent on fresh gas flow (FGF) in all. Work of breathing is low in all (no unidirectional valves or soda lime granules to create resistance). Minimum FGF In practice, most anesthetists will provide a minimum 5 L/min for children on up to adults to prevent rebreathing (or 2-3 x minute ventilation [VE], whichever is greater). Diagram of the Mapleson D and Bain NRB circuit. Click on the thumbnail, or on the underlined text, to see the larger version (10 KB). The Bain circuit is a "coaxial" Mapleson D- the same components, but the fresh gas flow tubing is directed within the inspiratory limb, with fresh gas entering the circuit near the mask. Fresh gas flow requirements are similar to other NRB circuits. The Bain has been shown to add more heat and humidity to inhaled gases than other Mapleson circuits. Diagram of the Mapleson D - how it works. Click on the thumbnail, or on the underlined text, to see the larger version. How do NRB’s work? 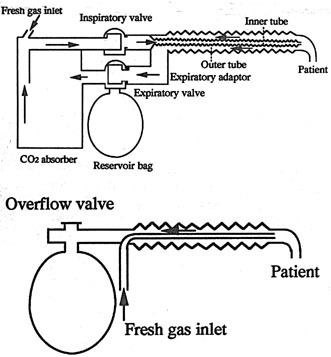 During expiration, fresh gas flow (FGF) pushes exhaled gas down the expiratory limb, where it collects in the reservoir (breathing) bag and opens the expiratory valve (pop-off or APL). The next inspiration draws on the gas in the expiratory limb. The expiratory limb will have less carbon dioxide (less rebreathing) if FGF inflow is high, tidal volume (VT) is low, and the duration of the expiratory pause is long (a long expiratory pause is desirable as exhaled gas will be flushed more thoroughly). All NRB circuits are convenient, lightweight, easily scavenged. One objection is that the circuit must be reconfigured between cases, with the possibility of error. Occlude the patient's end of the circuit (at the elbow). Fill the circuit, using the oxygen flush valve. Release the occlusion at the elbow and flush. A Venturi effect flattens the reservoir bag if the inner tube is patent. Dorsch & Dorsch (Understanding Anesthesia Equipment 5th ed. 2008:942) give a second test. If fresh gas flow is established, and the inner tube is occluded, the flowmeter bobbins (if present) should dip (due to back pressure) if the inner tube is patent. The circle is the most popular breathing system in the US. It cleanses carbon dioxide from the patient’s exhalations chemically, which allows rebreathing of all other exhaled gases (a unique breathing arrangement in health care, but used extensively in other environments e.g. space, submarine). Diagram of the Circle system. Click on the thumbnail, or on the underlined text, to see the larger version (20 KB). Circle components: fresh gas inflow source, inspiratory & expiratory unidirectional valves, inspiratory and expiratory corrugated tubing, Y connector, overflow (called popoff, adjustable pressure-limiting valve, or APL valve), reservoir bag, carbon dioxide absorbent canister and granules. Resistance of circle systems is less than 3 cm H2O (less than the resistance imposed by the endotracheal tube). Dead space is increased (by all respiratory apparatus). VD/VT= 0.33 normally, 0.46 if intubated and 0.65 if mask case. Mechanical dead space ends at the point where inspired and expired gas streams diverge (the Y-connector). Diagram of the King circuit (top) compared to the Bain. (Modified from Nakae Y et al. Anesth Analg 1996;83:488-492). Click on the thumbnail, or on the underlined text, to see the larger version (28 KB). A "Universal F" or "Mera F" circuit (KingTM circuit) is a coaxial circle system, with the inspiratory limb contained within the expiratory. Like a Bain, it is less bulky, and may offer more heat and humidification of the inspired gases. Like the Bain, occult disconnection or kinking of the inner limb causes a huge increase in dead space and respiratory acidosis (Anesth Analg 2001;93:973-4). This respiratory acidosis does not respond to increased minute ventilation either- if exhaled gases are not forced through the absorbent granules, no amount of ventilation will cleanse carbon dioxide from the patient's exhalations. The tests for inner tube patency which can be used for a Bain circuit are not readily adaptable to the circle system connected to a King circuit.